We pick you up from your hotel in our private transport, after 2 hours of travel, we reach Cusipata where our private camp is located. Arriving to our private campsite will provide all personal equipment for boating like life jacket, a waterproof jacket, wet suit and helmet. Our guides will give a safety talk and instructions about canoeing in class II rapids. After visiting the river for two hours of canoeing, our transport returns to the camp.The lunch will be served at the camp, then walks around to appreciate the scenery. Then we rest in our "CASA CUSI", a camping area with comfortable dining room, sauna, Jacuzzi, hammocks and great food. At night you sleep under the murmur of the river. 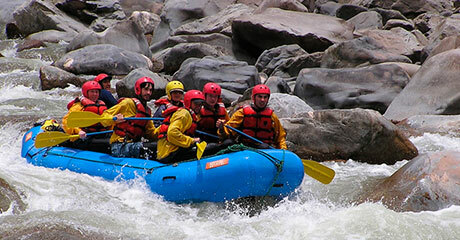 After a relaxing sauna and a good night's sleep, enjoy a healthy breakfast and head to the section of river called CHUQUICAUANA, where we will visit the class III rapids. You will enjoy 2 hours touring the river adventure. 2 to 3 pax US 170.00 dolars per person. 4 to 7 pax US 165.00 dolars per person. 8 to 12 pax US 145.00 dolars per person. 12 or more US 125.00 dolars per person.